That time I was exploring Hiroshima and ultimately I put Matsuyama and the Togo Onsen (Hotspring) on my itinerary. If you are looking for something new, I would recommend this city and I had a great experience! Matsuyama is the capital of the Ehime prefecture and the largest city in Shikoku. Developed as a typical Japanese castle town, the city has certain historic flavors from different eras. In a nutshell, I took off from Okayama and spent 2 days in Matsuyama. Day 1 we went to city center – Matsuyama Castle Town (for the cherry blossom) and the main shopping streets; for Day 2, I visited the Dogo-onsen shopping street, Ishite Temple and Dogo park for more cherry blossom excitement. Matsuyama is located at the corner of Northeast Shikoku and charmingly surrounded by the Seto Inland Sea. In fact, it’s a little far from the other two main cities in the country (both three hours away from Takamatsu or Okayama). But well, I thought my plan was perfect to hit one bird with two stones – Okayama > 3 hours train to Matsuyama > 2.5 hours ferry to Hiroshima, and then I met the most amazing cherry blossom I have ever seen. No complaints. Both rapid bus and JR trains are available @ the Okayama station. The costs were roughly the same, the time required was roughly the same, the level of comfortableness was also the same – basically, it’s up to your personal choice. If I really have to point out each method’s problem, I didn’t have to change vehicles taking buses or enjoyed higher flexibility with my traveling schedule taking the train. The replica steam locomotive ride was based on a novel written by a great Japanese novelist Natsume Sōseki (夏目漱石) of the Meiji period, setting in the city of Matsuyama. It’s definitely a super highlight of the city. Once we settled in the hot spring hotel we took the steam locomotive and headed straight to the Matsuyama Castle. The cherry, yes, yes, yes, was in full bloom and everyone was excited. 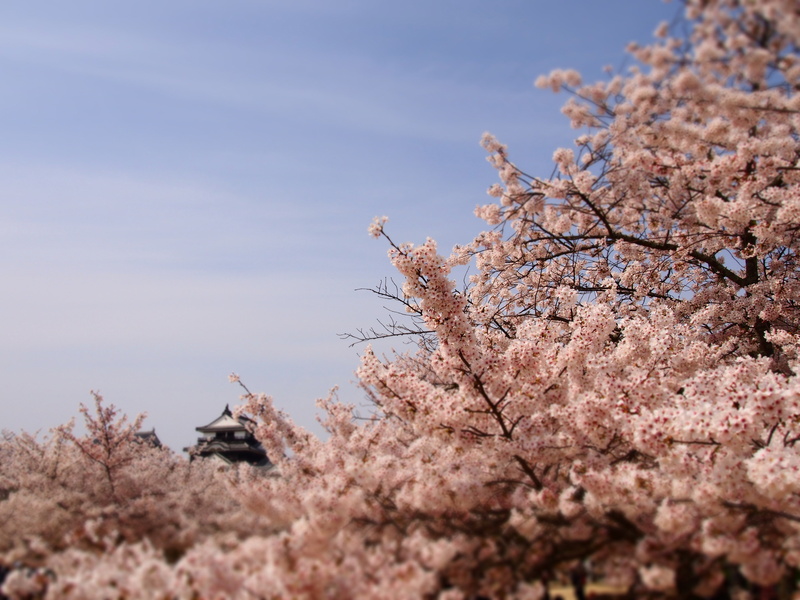 The whole experience was fun – the mascot character, the historic sites, the chairlift and ropeway, and the cherry blossom was just perfect for different types of visitors. That’s my chairlift experience Uphill, you have a little piece and quiet to yourself, but the queue is longer than the ropeway. Bought a package ticket for the entrance – it includes transportation up and down the castle, plus the famous udon lunch. The castle in Cherry full bloom, it was terrific. Matsuyama has a very rich literary heritage, and Ryōtarō Shiba is one the most well-known novelists from the city. The Saka no Ue no Kumo (Clouds over the slope) is an important Japanese historical novel set in the Meiji period. The triangular museum with concrete exterior itself was designed by the famous Japanese Architect, AndoTadao (安藤忠雄), and inside the premise, it has shown plots of the novel and pictures of Matsuyama from the Edo period. The Bansuiso (Bansui Mansion) was up the slope on the same road of the Saka no Ue no Kumo Museum and the final stop of the city tour bus. It was an elegant French style mansion building constructed in 1922 and now it was a multi-functional venue for private parties and functions. It has also areas opened to the public for visitors to appreciate the architecture and small exhibits. Enjoy some English / Japanese crossover style tea set @ the shopping district after a day of walking ! Thanks BonBon ~ I think you will enjoy it, too! I didn’t even know that the other three main islands are connected by the high-speed railway! We are now encouraged to travel to Japan. We will not leave out Shikoku and its hidden treasures. Love all the photos! Such stunning photos, Japan is very high on the list for me and my partner. And the more pieces I read like this I want to visit even more. Matsuyama Castle Town looks so pretty. Thanks Aimee 🙂 I hope the post is helpful and inspiring to you! Matsuyama is indeed a revelation. This charming place gives a totally fresh and new perspective of Japan. The natural landscapes look so enchanting. The replica locomotive ride again is something that really interests me, given my fascination for trains and engines. Sadly, I haven’t been to Japan yet so some of the facts you mention were unknown to me. Matsuyama and its castle look lovely – I think I’d like it there! And the cherry blossoms… so beautiful! It looks like your trip to Japan was an amazing one! This post was really insightful. I love Japanese food (the ramen looks amazing) and it seems like you were able to fit a lot of sightseeing in while you were there! I hope to visit Japan at this timeframe too- the weather and scenery look beautiful! Looks amazing when all the trees are blooming! If I ever decide to visit I would definitely schedule it at this period. The view of the city from above is gorgeous and the locomotive looks really cute. I would love to try the food though. Traditional ramen sound just perfect at the moment. I love Japan and I’ve been there for all seasons except for Spring! Really wish I can be there soon to catch the beautiful Sakura! Thanks admintesting123, all seasons of Japan has it’s own special moments and I hope you would get to experience the blossoming soon!